Last week’s protests in Hambantota, in southern Sri Lanka, against the launch of a special industrial zone – conceived, promoted, financed, built and to be operated by China – may not hold good for India, strategically. Hambantota, in the southern province of Sri Lanka, is the top tourist destination of the island nation, 240 km away from the capital, Colombo. Home to half a dozen national parks, botanical gardens and hot springs, Hambantota has been witnessing rapid developmental work over the last decade. Invited by then Sri Lankan president, Mahinda Rajapaksa, China has pursued the development of modern infrastructure in the underdeveloped regions of the country. The first phase at Hambantota was completed in November 2010 with a USD 361 million loan granted by China’s Exim Bank. The Mattala Rajapaksa International Airport, Hambantota Cricket Stadium and Conference Centre were similarly financed with Chinese credit. Unfortunately, most of these infrastructures remain underutilised. After Chinese premier, Xi Jinping’s visit to Sri Lanka in September 2014, President Rajapaksa signed an agreement, giving Chinese companies operating rights to four of the seven container berths at Hambantota port, on a 35-year lease. Two visits by Chinese nuclear submarines to Sri Lankan ports, in 2014, alarmed India and soured India-Sri Lanka relations. President Maithripala Sirisena sought to allay India’s concerns after he assumed office in January 2015. By then, it was too late. The Sri Lankan government reviewed the China-financed port and infrastructure development projects, only to discover that it is in the grip of a debt trap, financed by China. China’s investments to the tune of USD 8 billion in Sri Lanka are loans on commercial rates and more than a third of the government revenue goes towards servicing these loans. To service the debt and operating costs, Colombo has leased both the Hambantota deep sea port and Mattala Rajapaksa International Airport to Chinese companies on a long-term basis. Cut to 2017, Hambantota was in the news as local police used tear gas and water cannons to disperse hundreds of stone-throwing demonstrators protesting against a planned investment zone supported by China. Protestors allege Sirisena is trying to evict thousands of families to provide 15,000 acres of land in the projected industrial zone for Chinese investors. Sounding upbeat, the Chinese ambassador to Sri Lanka, Yi Xianlang spoke at the inauguration of the special industrial zone. “This is the moment for China to help other countries who need investments,” he said. He also said that the investment zone would be the most important economic project of this government and “if everything goes well,” China would invest USD 5 billion over the next three to five years and create 100,000 jobs. 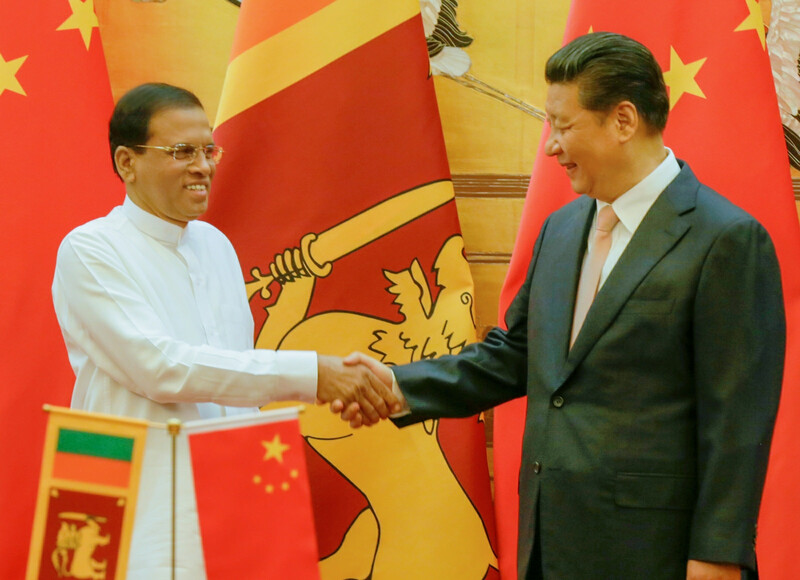 “No force can stop the cooperation of China with Sri Lanka,” Yi asserted. Hambantota is not about developing the Emerald Island or helping create jobs. It reflects not only the Chinese ambition to build a ‘Maritime Silk Route’ to the oil-rich Middle East and onwards to Europe, but also shows its flexing military might. Latest media reports suggest that in May 2016 a Chinese nuclear attack submarine was docked in the harbour in Karachi. This proves that Beijing might be scrutinising the movement of Indian warships far more closely than earlier. Similarly, an image has surfaced, showing a Chinese diesel-electric submarine in Kota Kinabalu in Malaysia, after an extended deployment in the Indian Ocean. But, Beijing insisted that it was present at the coastal site during a rest period from anti-piracy patrols off the Somalian coast. No doubt, India has been strung in the Chinese string of pearls for more than two decades. The expression, ‘string of pearls’, originally used by analysts working for the US Department of Defense and later popularised by the Booz Allen Hamilton report, describes China’s strategy for building ports. Beijing, on the other hand, dismisses it as a ploy by Washington to get close to India as Chinese influence grows. Time and again, Beijing has dismissed the String of Pearls theory. Instead, it stresses on its financial and technical assistance to the countries in the Indian Ocean Region (IOR). The Chinese Academy of Social Sciences (CASS) published the June 2013 Blue Book called Development Report in the Indian Ocean. It asserted that China has no military strategy for IOR. A few months later, in October 2013, President Xi Jinping initiated the Maritime Silk Road (MSR) concept to reinforce the message that China sought only economic objectives in the IOR. Thanks to the ingenuity of Chinese academics, the ‘string of pearls’ was reincarnated as ‘MSR’. Nevertheless, the string of pearls is not based on any fiction or fear but on facts. The Hambantota facility in southern Sri Lanka has long been included on the list of China-backed ports. Chittagong in Bangladesh, Gwadar in Pakistan, Marao in the Maldives, and Kyaukpyu in Myanmar are the other notable mentions in Beijing’s ‘string of pearls’. Chittagong aside, China is exploring a deep-water facility at Sonadia, off Bangladesh’s Cox’s Bazar coast. To counter China’s growing influence India has upgraded its military ties with Maldives, Madagascar and Myanmar in Indian Ocean Region and with Singapore, Indonesia, Thailand, Vietnam, Taiwan, the Philippines, Australia and Japan. India has also enhanced its economic and security relations with South Korea, Japan, Taiwan, Vietnam, Singapore, Indonesia and Australia. In 2015, when Indian prime minister, Narendra Modi visited Dhaka, an agreement was signed with Bangladesh. The fact that it allowed Indian cargo vessels to use the China-backed Chittagong and Mongla ports has huge strategic implication. This attempt by India to tug at the Chinese string of pearls may surely be of significance in the future.